When one thinks of Alabama there can be no forgetting about the heroic work conducted by African Americans in the fight for freedom and quality. The role of Dr. Martin Luther King is well documented. However, this book by Dr. Richard Bailey has given students, scholars, and the general public a well-documented and carefully written book about the role of African American in the turbulent history of Alabama. This profound piece of history should be required reading for all students, especially those entering the field of teaching. This book is a must for public schools, libraries, churches, businesses, and certainly colleges and universities. Richard Bailey’s superb book represents a literary homecoming for Alabama’s African Americans. He effectively uses these vignettes of validation to chronicle exploits of Alabama blacks who struggled and overcame the chains of their circumstances. In short, this historical work gives us a personality blue print of how the migration of African Americans into and out of the state helped to make Alabama what it is today and what it promises to be tomorrow. This collection of profiles of over 400 African-Americans from Alabama is an enlightening work of history as well as a valuable reference source. It is enlightening in revealing the extraordinary impact of these Alabamians on state, national, and world history. As a reference source, it provides convenient and easily readable sketches of many historically important figures whose stories are not always accessible. They Too Called Alabama Home reflects years of research by Dr. Richard Bailey that builds on his earlier valuable work on nineteenth-century African-American legislators in Alabama. It is a welcome addition to our historical literature. Richard Bailey has done it again! After helping to fill the gap in historical literature on African American officeholders during Alabama’s Reconstruction era, he has now gone a great leap further in his latest book and has rescued ‘from oblivion’ not only politicians, but Afro-Alabamians who distinguished themselves in a variety of professional areas. The breadth of coverage, from just prior to statehood to the end of the twentieth century, will make this work extremely useful to researchers and immensely valuable to general readers. Ancient Rome has its Pliny, but Afro-Alabama has its Bailey, and the history of the state is better because of him. Dr. Amilcar Shabazz, Asst. Prof. This new work by Dr. Richard Bailey is a valuable compendium of Alabama-related African Americans who have been pioneers and key contributors to the culture and history of Alabama. If this nation is to be the true exemplar and leader of global democracy, it must become “a more perfect union” among other things, by encouraging publication and reading of more books by historians such as Richard Bailey and other minority researchers. The Rev, G. Murray Branch, D.D. I do not know of any other reading that gives a more concise account of our ancestors through the Reconstruction era in the south. Dr. Bailey knows his subject and provides us with a valuable resource of his knowledge. 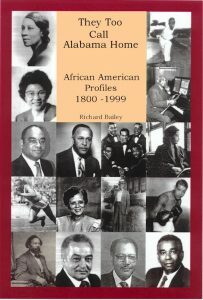 They Too Call Alabama Home: African American Profiles 1800-1998 by professional historian and scholar Dr. Richard Bailey offers a long-overdue examination of the contributions to American life made by more than 400 individuals, all of whom have ties to Alabama. Members of this diverse group impacted education, religion, civil rights, business, sports, entertainment, music, politics, and the military. A readable work, They Too Call Alabama Home is a valuable resource to anyone seeking a more complete understanding of American history and culture. In this book Dr. Richard Bailey has presented in a very effective and illuminating way the lives and work of noteworthy African-American Alabamians. It fills a much-needed void in Alabama’s history. Richard Bailey’s book is a masterful example of research and writing, a remarkable historical preservation documentation of occupational endeavors of African Americans who made their marks in history.